"Latin Loanwords in Old Frisian and the Problem of Relative Chronology"
To date, the Latin loans in the early phases of the Frisian language have remained a much unexplored field. Kluge’s important contribution on Latin and Romance loans in Germanic in Paul’s Grundriss der germanischen Philologie (1901) contains not one example from the Frisian evidence. In 1921, Holthausen (1921) published a long list of Latin and Romance loans in Old Frisian, but without any comment on, e.g., chronology or distribution. Yet, the number of Latin loans in Old Frisian is considerable and quite a few of these are early, because they show evidence of having gone through the early sound changes that turned West Germanic into Old Frisian. However, a number of Latin loans are problematic. Although they must have been borrowed after the conversion, yet phonologically they would appear to be early, e.g. ompel ‘sanctuary lamp’, Ondreus ‘Andrew’, tselke ‘chalice’. Such loan words raise questions concerning the validity of relative chronology and the vitality of sound-laws. My paper elaborates on Dekker’s (2000) informative survey of the field. 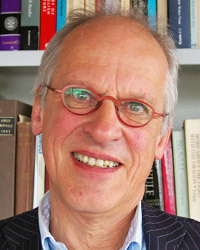 Dekker, Kees. ‘Between Rüstringen and Rome: Latin Loan Words in Old Frisian’, Philologia Frisica anno 1999 (Leeuwarden: Fryske Akademy, 2000), 27–56. "Validating multiple varieties in the L2 classroom"
In second language (L2) education, sociolinguistic competence is typically considered the most challenging of the four components that make up communicative competence. Sociolinguistic competence refers to the ability to interpret sociolinguistic variation, and to use language appropriately in social and situational contexts. Not only is the development of this capacity perhaps incompatible with the constraints of the L2 classroom, but the very concept of variation also puts into question the native speaker model, still central to L2 instruction and assessment. Not surprisingly, variation poses a “pedagogical problem” in the L2 classroom, one that is unlikely to be solved through particular L2 materials or textbooks. In my presentation, I will focus on developing teachers’ sociolinguistic awareness as fundamental to validating multiple varieties in the L2 classroom. Specifically, I will draw on Backward Design, in particular the six facets of understanding, for integrating the notion of sociolinguistic varieties and variation into teacher education. Johanna Watzinger-Tharp received her Ph.D. from the University of Texas at Austin in Applied Linguistics, and is currently Associate Professor at the University of Utah with a dual appointment in Languages & Literature and Linguistics. She also serves as Associate Dean for Interdisciplinary & International Programs in the College of Humanities. Her research focuses on the intersections of variation in language, L2 methodology and teacher education and, more recently, on Utah dual language immersion program demographics and academic achievement.